What has 130 watts per channel, support for video up to 1080p, and more ports than an island nation? I'll give you a hint: It's not a zebra on roller skates. 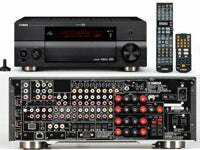 It's Yahama's new pair of receivers, the RX-V2700 ($1700) and the RX-V1700 ($1300). I'm not entirely certain the electrical system of my new apartment could handle such a beast. But I suppose you never know until you try. Frighteningly, Yamaha's press release touts them as "Mid-class" receivers, delegating my Onkyo stereo receiver to "Baby's first radio-class." I'd love to list all of the ports this has, but frankly I don't have the time, energy, or space. Suffice it to say that it runs the gamut from composite video to HDMI, and it'll upconvert composite, S-Video, or component to 1080p. The higher-end RX-V2700 pictured also has an Ethernet port that allows you to hook it up to your home network, where it can stream sweet sweet music through the ether. Let met tell you, if I ever own enough equipment to connect something to each and every one of these ports, then it will prove one thing: my mom was wrong about my choice of career paths, because blogging pays awesome .